head to iSpeakerRate to have a look. 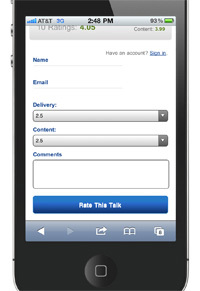 Prior to last week, you could only rate talks using the mobile site–no commenting allowed. Using some code we wrote as part of the widget launch, though, you’re now able to comment and rate talks at the same time. We’ve also made the mobile site easier to access. Prior to these recent efforts, only visitors to the site’s homepage were redirected to the mobile site, even though most of our visitors come directly to talk and speaker pages. We’ve changed this so that all mobile users are now shown the mobile site, with an option in the footer to toggle between the two views.